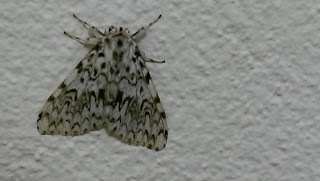 A Black Arches, which John Baker states, in his report of 2004, is rare in the county. Black Arches isn't rare any more, Paul. Jon said in his 2006 annual report that it 'seemed to be increasing fairly rapidly and spreading' and indeed he was right, it's a regular visitor to mid-summer moth traps these days, at least in north Carms. That toilet block in Pembrey Country Park is always good for moths! Please check it whenever you are in the vicinity. I always check toilet blocks anywhere for moths! Has to be done with a certain amount of care though!